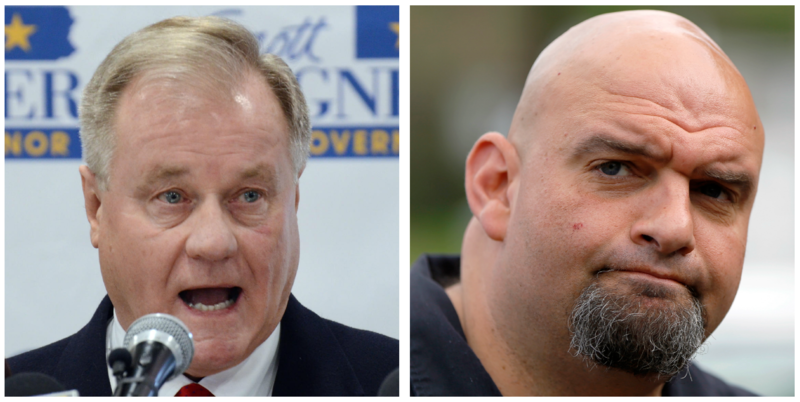 Republican gubernatorial primary winner, Scott Wagner, and Democratic lt. governor winner, John Fetterman. In the Lieutenant Governor’s race, Democratic incumbent Mike Stack has lost reelection in the primary. This is the first time in Pennsylvania’s history that a sitting Lt. Governor has lost reelection. In a crowded field, Braddock mayor John Fetterman won the party nomination with 40 percent of the vote. He’ll run against Jeff Bartos on the Republican side. Bartos campaigned with Wagner. In the Republican U.S. Senate primary, U.S. Rep. Lou Barletta easily beat his Republican rival. He’ll face Democratic incumbent Bob Casey, who is among 10 Democratic senators seeking re-election in states won by Trump. In the 12th Congressional District, incumbent Republican Tom Marino beat out Doug McLinko. On the Democratic side, the race was too close to call as of 12:02 a.m. on Wednesday. At that time with 99 percent of precincts reporting, Marc Friedenberg had 50.3 percent of the vote and Judy Herschel had 49.7 percent of the vote. In the 13th Congressional District, there were eight Republicans vying for the seat vacated by Bill Shuster. Dermatologist John Joyce beat out the competition. He’ll face Democrat Brent Ottaway, who ran unopposed, in the fall. In the 15th Congressional District, Democrat Susan Boser beat her primary competitor, Wade Jodun, by a 3-to-1 margin. Boser will face Republican incumbent Glenn Thompson in the fall. In the 30th State Senate seat, Judy Ward has won the Republican primary. She’ll take on Democratic candidate Emily Best in the fall. In the 79th State House district, Republican Lou Schmitt has won his primary. No Democrat ran in this heavily Republican district, so Schmitt will likely take that seat. In the 80th State House district, Republican Jim Gregory will face Democrat Laura Burke in November.